TFA, TWS, CW, & IW were all written by Christopher Markus & Stephen McFeely. Anthony & Joe Russo directed all except TFA (Joe Johnston). I’m here to show how the work of the SAME TEAM is very subtext-heavy. Because I want to. DISCLAIMER: This is not an "it's gonna be canon!" thread. No part of me ever expects that to happen. You shouldn't either. Consider this a collection of evidence that interpreting them romantically is no stretch, for the next time someone says "they're BROTHERS it isn't GAY." 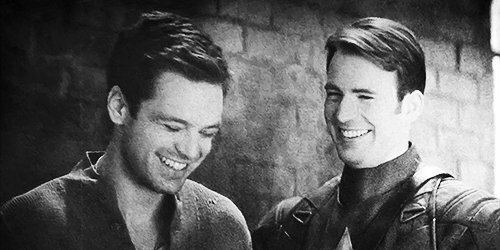 ANOTHER DISCLAIMER: This is not a “stevebucky is the only valid ship” thread. Ship what you want! Stevetony, samsteve, stevepeggy, sambucky, whatever floats your goats: valid. If anyone uses this thread against other shippers I WILL physically fight them with my tiny fists.